Modern, prestigious, convenient! What else can you wish for? Thornhill Valley has all those qualities and more. 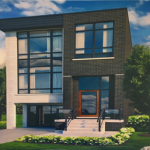 With the growing popularity of Thornhill in general new bustling developments have changed this area dramatically making it a home for many new families. The community of the Valley of Thornhill is mainly comprised of Jewish, Russian and some other ethnicities. The streets are full of young families, little children and also teenagers. As a very safe and family-oriented neighbourhood the area is attracting many new buyers every year. Located in Concord in the north-west side of Rutherford road and Bathurst street Thornhill Valley has an excellent access to Hwy 7 and Hwy 407 as well as Hwy 400. Close by is Langstaff Go station where you can board ether York Region Transit or the VIVA rapid transit system. This central location makes it ideal for you to commute either to Toronto or within York region. The area’s real estate is comprised of freehold townhouses and detached family homes and offers new developments as well some older homes. The prices are on the rise and at present vary from $ 500,500 for a 3 bed townhouse to 4 bedroom detached ranging 800,000 to 900,000. However, due to the high demand in the area it might change in the near future making the properties less affordable. Thornhill Valley features lots of trails, parks, playgrounds and fields and creates an atmosphere of an open space and being close to nature even though it far from being rural. The area has an advantage of being in close proximity to various restaurants, coffee shops, shopping, entertainment venues and businesses. The Valley of Thornhill is a home to a significant Jewish community. Therefore, in the neighbourhood, there are a variety of Jewish institutions, services and community resources including synagogues and Jewish schools as well as kosher restaurants and stores. The main attraction of the area is the magnificent Joseph & Wolf Lebovic Jewish Community Campus spread across 50 acres of land just north of Rutherford road that opened its doors just over a year ago. The campus is designed for the variety of ages and interests and is the home to The Schwartz/Reisman Centre, the Leo & Sala Goldhar Conference & Celebration Centre, Phil Granovsky Sports & Recreation Pavilion, Paradise Cafe, The Reena Community Residence and more. The campus offers both educational and recreational facilities, with public swimming pools and ice arenas. There are also a few excellent golf courses and clubs nearby. J.Roots Supplementary Jewish School: there is a vast number of Jewish educational programs you can choose from including preschools, day schools and supplementary schools and adult education programs. Other schools in the area are Nellie McClung PS for elementary students and Vaughan Secondary School for high school students. Both schools have good rating and an excellent reputation. Overall, Thornhill valley is an excellent area to raise a family and enjoy all the amenities and services available without having to commute long distances. If you have any questions with regards to purchasing a property in Thornhill Valley or if you are looking to assess the value of your home in this area, please call me 647-459-9459 directly for a consultation.